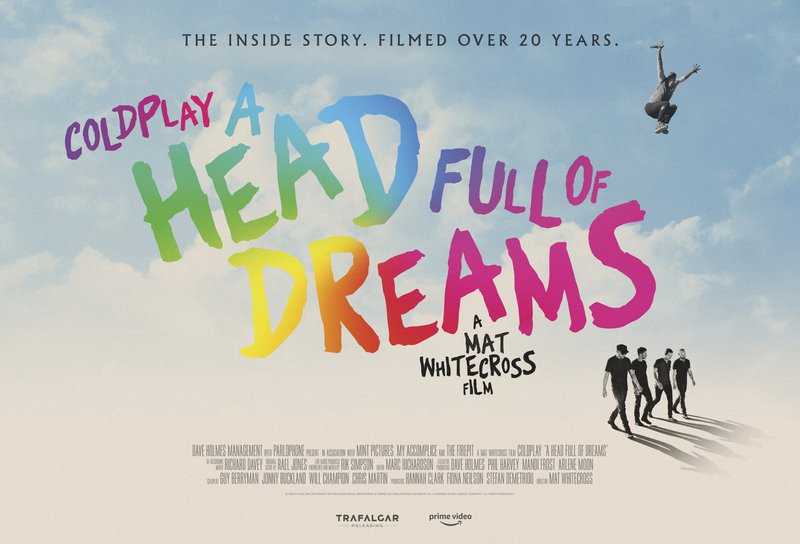 Coldplay's new film 'A Head Full Of Dreams', which throws the doors wide open on their colorful 20-year history, will be available to stream exclusively on Amazon Prime Video starting in the U.S., U.K., Australia and New Zealand on Friday, November 16, with local language versions available globally soon after. The documentary release will be preceded by a special one-night showing of the film in collaboration with Trafalgar Releasing in more than 2,000 cinemas around the world, on Wednesday, November 14. In anticipation of the launch of 'A Head Full Of Dreams' on Amazon Prime Video, Coldplay premiered three live tracks -- 'Stayin Alive' (Live at Glastonbury with Barry Gibb), 'Us Against The World' (Live in Leipzig) and 'Don't Panic' (Live in Paris) -- available to stream only on Amazon Music. 'A Head Full Of Dreams' offers an in-depth and intimate portrait of the band’s spectacular rise from the backrooms of Camden pubs in London, to selling out stadiums across the planet. At the heart of the story is the band’s unshakeable brotherhood, which has endured through many highs and lows. The film is helmed by Mat Whitecross -- director of 'Oasis: Supersonic', the acclaimed 2016 Oasis documentary -- who met the four friends at college in London, before they’d even formed the band. From the very first rehearsal in a cramped student bedroom, Whitecross has been there to capture their music and their relationships on tape. Whitecross has since directed many of the band’s most iconic videos (including 'Paradise', 'A Sky Full Of Stars' and 'Adventure Of A Lifetime') and has continued to document the band’s musical and personal evolution. Using extensive unseen archives, behind-the-scenes and live footage, the new documentary sees the band reflect upon their two decades together. It was filmed during Coldplay's record-breaking 'A Head Full Of Dreams Tour', which was certified as the third biggest tour of all time, playing to more than 5.5 million fans across the world. Check out the trailer for the film below.